The Marche region has the sort of knobbly green landscape that strikes us as so quintessentially Italian, where little hills jostle for position from the mountains to the sea, and at times every third summit seems to be crowned by an ancient village or abbey, although sometimes they are hard to tell apart. 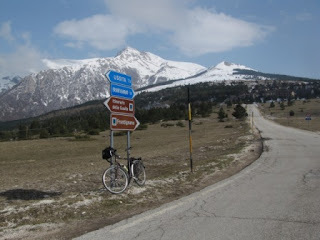 After our short foray into Umbria we crossed back over the spine of Italy to Visso in the Marche on Monday14th March. Visso sits at the intersection of four valleys – or perhaps gorges describes them better – at the edge of the Monti Sibillini national park, high in the Apennines. It clearly had a period of considerable wealth in the 15th century, when the town centre was built up with tall palazzi and town houses reaching four storeys, and castle walls stretched across the steep hillsides above. Today it is more large village than town but the mediaeval fabric is intact, and it is billed as ‘one of Italy’s prettiest villages’. We only found it as we were passing that way, but it had a camper stop too, that was free with optional electricity charged by the hour, and we ended up staying two nights. The tops of the Monti Sibillini were still in snow, and I (Rob) had a great afternoon cycling up to the ski resort of Frontignano in the bright sunshine, with the light glinting on the snowy peaks all around me. From Visso we headed north to Urbino, through more of this undulating patchwork scenery. Several towns on the way tempted us, but we’ve got to a stage where we can’t do them all. Camerino looked interesting, high on its hill and enclosed by sheer walls of churches and houses, but we were put off by not instantly finding an easy place to park the van and so decided the town could wait for another year. We drove all the way up another hill, to Arcevia, because we had some idea that it had plentiful camper stops, but we failed to check our book and found only a well-signposted campsite. So, despite it looking like another appealing hill town, we drove onwards in search a good place to wild camp. We found it shortly afterwards behind a hilltop chapel with terrific 360° views – until a cloud enveloped us an hour after parking up, after which we saw nothing, but heard plenty of wind and rain. On the next day, Thursday 17th March, the Italian state celebrated its 150th birthday, and the flags were out when we got to the village of Pergola. It had been declared a bank holiday and there was quite a Sunday feel about, with many people out sightseeing and strolling. The official celebrations have been accompanied in the Italian media by an outburst of soul-searching about whether the country has ever really been unified – Italians generally love their regions but are less fussed about Italy itself, and on the day, the politicians of the Northern League caused a stir by refusing to sing the national anthem, or just not turning up at all. We continued towards Urbino on some very minor backroads, many of which had recently experienced landslides, ‘frana’, but which took us through some typically gorgeous Marche countryside close to Acqualagna and Fermignano. In some respects you could view Urbino as a palace with a town attached, so much does the Palazzo Ducale, built by Federico de Montefeltro in the 1400s, dominate the place. The palace building itself was fascinating to us for its classically Renaissance design, but since the place is now largely a museum and art gallery we got to see a few important works thrown into our bargain price of free, due to arriving on Italy’s birthday. It’s hard to imagine how life was lived in these walk-through series of staterooms, apartments and bedrooms, now devoid of furnishings, and we were struck by the lack of privacy there must have been. The room decorations were marvellous, especially the inlaid wood doors and panelling. Some of these depict all the accoutrements needed by a true Renaissance prince, and Federico was regarded as an enlightened ruler, despite looking a bit of a bruiser, so much so that a de rigueur book for princes of the era, ‘The Courtier’ by Baldassare Castiglione was based on the court at Urbino. Famous sons of Urbino include Rafael, the artist rather than the ninja turtle, and someone who struck a real chord with me (Lesley), as he comes up time and again through my interest in Tudor history and my experiences of taking school journeys to Church Langton in Leicestershire - Polydore Virgil. 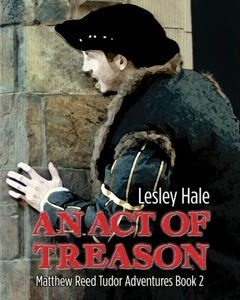 He came to England in 1501 and while there wrote his Historia Anglica, a book still used as a contemporary source despite its very strong Tudor bias. During his time in England Polydore Virgil managed to mingle in exalted circles at court, and was at one time given the rectorship of Church Langton, among some of his many clerical appointments. He fell out of favour though, after making the mistake of writing some unflattering comments about Henry VIII and Wolsey in a letter, and failing to realise that all his correspondence was intercepted. After a short spell in prison and intercession from a pope, he remained in England to complete his history and dedicate it to Henry VIII, returning home to Urbino around 1551, where he died a few years later. The rest of Urbino is classic hill town strolling territory, with mediaeval walls and gates, narrow streets and alleyways, a few steep climbs and a main square, the Piazza della Repubblica, which just cries out for a stop for coffee or a gelato. We were not so impressed at first with the overall ‘brickiness’ of the place, after some recent towns we’ve visited, but it actually kind of grows on you, and has its own elegance. Daytime parking for motorhomes seems to be on the large lower square just outside the walls, Piazza Mercatale, which is perfect for views of the palace looming above and is just a short, if steep, walk away from the heart of the old town. If you don’t want the climb there’s even a convenient lift up to the palace. We would have been happy to spend the night there, if it were not for the fact it worked out expensive and there’s a new, free, area di sosta downhill on the edge of town. It’s another carpark, with water and dumping facilities, and at 3 p.m. it had been deserted, but when we returned there in the evening we were amazed to see a long line of large white motorhomes parked in a row up the side of the area. We hadn’t seen that many motorhomes since Norway. We left a decent gap in order to avoid claustrophobia, only for the next van to arrive and line up neatly beside us, filling in the space we had left. We have not yet been able to ask an Italian camperista about the compulsion to huddle together so much, rather than spread out, but it was a phenomenon that amused us on several different sites. Urbino camper stop – this was a massive car park, so why did they all line up on one side next to us? In recent days we seem to have crossed an invisible north-south divide in the Italian camper world, and suddenly we are finding well-indicated camper stops everywhere. Many are free, some are just carparks, others like Visso or Urbania have electricity, and in between these are yet more ‘camper service’ facilities for dumping and refilling, sometimes at petrol stations and the like. 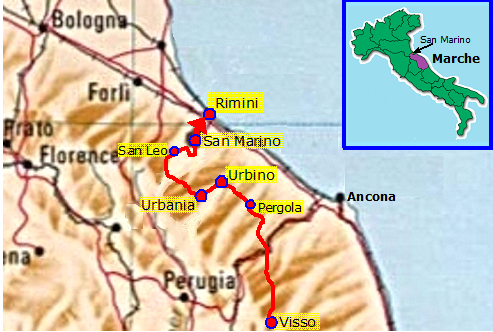 The number of motorhomes on the roads has also mushroomed, but we don’t know how much of this is down to arriving in the affluent north of Italy, and how much down to the approach of Easter and the better weather. Valle dell'Orsaiola near Urbania, and the Barco Ducale – the very nice area di sosta is behind this impressive building. Only 17km from Urbino lies the little town of Urbania, whose name relates not to its bigger neighbour but to Pope Urban 8th after whom it was named in the 1630s when the town was part of the Papal States. The town is older though and has another of those lovely mediaeval-looking centres at which Italy excels, this time of brick buildings and arcaded streets all on a strict grid, and overhanging the gorge of the River Metauro. We happened across the camper stop here, in a country location beside a former ducal hunting lodge, and it was so nice we stayed for two nights. It had free electricity (how do they do it? It was fairly low capacity but at that price we couldn’t complain!) and we caught up with some washing while chilling out for a while. Not that the rest of our life is that hectic at the moment. Urbania’s most curious sight is situated in the Chiesa dei Morti, or Church of the Dead, and it lives up to its name. The church belonged to a religious association dedicated to providing proper burials for the destitute, and from the 1500s onwards these poor souls were buried in great numbers under and around the church. In the 1830s however the law changed, and all the bodies had to be transfered to new cemeteries outside town. On exhumation, a dozen or so were found to be mummified and extraordinarily well preserved, and these were propped up on display in the church, where they still ‘stand’ today, a rather macabre but fascinating spectacle of dull leathery skin, eyeless grins and taut, dry limbs. Each corpse had a story to tell (well not literally – the engaging guide related them on their behalf, in a slow Italian and bits of English so that we could follow). There were the ailments in life such as malnutrition or a withered limb, and causes of death such as a dagger through the heart – the desiccated heart was passed round in a plastic bag to let everyone see the incision – or in one case, so we were told, burial alive. From Urbania we headed north through more quiet back-country towards San Marino, and passed beneath the castle of San Leo which rises sheer from a towering crag, another work of Federico di Montefeltrone of Urbino. It offered fine views across to the rather more built-up hilltop of San Marino itself. San Marino is an oddity. A small independent city state of only 61 square kilometres located on a hill on the Italian peninsula, thoroughly Italian in its culture, its population and general character, but that through some quirks of history got left out when the Italian state was created in the 1860s. It was that oddness that drew us here to have a look, but we also rather expected some kind of sense of history and separateness, a charming old town perhaps, but we were wrong in all these respects. For somewhere that is officially a separate country, San Marino looks just like Italy. The street signs are identical, and only the colour of the police cars hinted at a difference. The steep streets of the centre look like a 19th century gothic fantasy of an Italian hill town rather than the real thing, which is what San Marino ‘city’ essentially is, and they are occupied by a great unending mass of tat shops, both expensive and cheap. There is something rather vulgar about the lines of jewellery, perfume, booze, souvenir and gun – yes, gun – shops that line these streets, and the constant throng of visitors and school parties hardly adds to the charm of the place. San Marino makes part of its money as a ‘tax haven’ and we can only assume that this has something to do with the large number of Russian visitors. You can just imagine the conversations : “No Oleg, I don’t want to go to Venice or Rome or see all those boring Renaissance palaces, it’s got to be San Marino – I’ve heard you can buy cheap watches and knuckle-dusters there, and we can stash our money away tax-free too”. One thing that San Marino excels at though is views of Italy. It is situated on the tallest hill for miles around, and commands sweeping prospects over the undulating countryside, from the snowy Apennines to the Adriatic, just a few kilometres away at Rimini. We parked overnight in a designated carpark (number 10), just below the old town, to which it was connected by a suite of public lifts. It was free overnight, and up to €8 for the daytime, but you may not need all day. (A note to other motorhomers : there is a large free carpark further down the hill at Borgo Maggiore, that sounds interesting as it is connected to the old town by cable car. However, with 2 returns on the cable car costing €9, you are better off paying €8 to stay in carpark 10, and with the free lifts you can come and go from your vehicle as many times as you want in the day). Our brief visit to San Marino coincided with a return of the cold weather, and to the accompaniment of a few thin flecks of snow we set off on the Monday afternoon on the road down to Rimini and the coast.